How long does it take to deliver my order? When you add the harvesting, processing, and delivery together, expect a minimum of about 6-10 days to the East Coast up to 2-3 weeks to the West Coast from the time the order is placed. You'll receive an email the day after shipping with a confirmation and tracking number (if your email service allows it to come through). On the day you place your order, our product is in Mother Nature's "warehouse", meaning that it's still hanging on the trees. Each day we send harvesting crews to the groves, and they pick enough to fulfill the orders. After trucking it to the packinghouse, we "run" the fruit through our packinghouse, where it is washed and sorted according to size. We pack the fruit into special shipping containers, then truck it down to Orlando where it is sorted and shipped by the Association. The time of delivery from there depends on the distance from Orlando. From February on, we don't ship every day, so there may be a longer interval between the time the order is placed and shipping day, although the packages usually require a day or two less for shipping since the channels are less clogged than during the Holiday Rush. Also, February, March and April varieties are very delicate, so we don't push as hard to make sure the fruit is very, very fresh. We can sometimes accommodate rush jobs if we have enough fruit already picked, so contact The Shop if you need it in a bigger hurry, understanding that there are still limitations. What is the cost of shipping and handling? The Orange Shop's shipping and handling charge is a uniform rate of $12.99 per package because we ship in bulk, rather than one package at a time. This is the 4th year we have maintained the same handling and shipping charge, so while it's unavoidable, we are doing our best to minimize your cost. What's the Shipping Cost to Canada? The shipping and handling to Canada is our standard US rate plus $10.00. Our "free shipping" offers remove the standard USA Shipping and Handling. The additional $10.00 Canadian charge, which is for customs, export, and Canada Post fees, would still apply. Can I track my package on your web site? We ship the packages most of the way through our Gift Fruit Shippers Association and then hand them off to either Fedex or the Post Office, so when tracking the package, you'll see those different steps. We can track your packages in our office, so the best way to check on the delivery status of your gifts is to give us a call at 800-672-6439. We'll be very happy to quickly check on things for you. How do you ship the fruit? We ship most of our packages through our cooperative, the Florida Gift Fruit Shippers Association. The Association was formed by our Grandfather and a number of other Gift Fruit Shippers back in 1946 to deliver fruit quickly and safely. We truck the fruit ourselves to locations near the delivery point, then the US Post Office makes the final delivery to the door, so the fruit arrives more quickly, and protected from freezing and damage. Click here to see more about the Florida Gift Fruit Shippers Association (it's a very unique story). Can I send packages to Citrus-producing states (CA, TX, AZ, LA, or NV)? Yes, on a schedule, during November through early March. 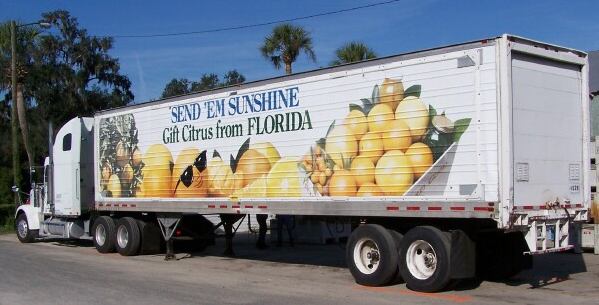 Every gift fruit shipper in Florida ships to these destinations on the same trucks to speed up delivery. We ship to these destinations once a month in November, and from February to April. Can I send fruit to Canada? We do ship to Canada on a certain schedule. The fruit has to be shipped by ground all the way since it has to clear customs at the border. Arrivals to eastern Canada are on a par with the US Northeast or Midwest. Shipments out to Alberta and British Columbia are risky, however -- the time required is a week to 10 days -- a long ride for perishable fruit in cold weather. How about Alaska? The only way to ship fruit to Alaska is via the US Postal Service. We strictly use the USPS Flat Rate boxes, and it works well! The largest size box they have is roughly equal in size to our 3/8 bushel (usually about 10-15 lbs of fruit), so that's the ONLY size to order if it's going to Alaska, please. Since it's flat rate shipping, there's no extra charge, and any free shipping offers WILL be honored! Florida Orange Shop Offers a Secure & Safe Online Shopping Experience & Respects Your Privacy. Copyright The Orange Shop. All Rights Reserved. The Orange Shop "Page" web page!